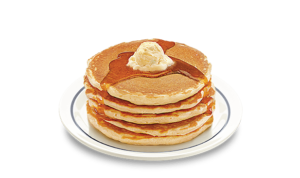 It’s National Pancake Day and you can receive a free short stack of freshly made buttermilk pancakes at IHOP Restaurants! Offer valid only on Tuesday, March 7, from 7 a.m. to 7 p.m. – with select locations participating until 10 p.m. Guests will be asked to give back and leave a donation of any size for their local charity partner or hospital affiliate. This year, IHOP expects to serve a record-breaking 5 million pancakes in a single day and raise money for leading nonprofit organizations like Children’s Miracle Network Hospitals, The Leukemia & Lymphoma Society, and Shriners Hospitals for Children. Every pancake served on IHOP National Pancake Day has a purpose, and every penny raised goes a long way in making a meaningful, and lasting, impact on so many kids and families. For more information on IHOP National Pancake Day, including local restaurant hours and charity support by restaurant, visit www.ihoppancakeday.com. So glad I saw this. We’re going!